At the end of September, a few days in advance of the publication date of recent years (between 3 and 9 October), the Parma Chamber of Commerce published the 2018 quotations for Italian tomato products from the most recent harvest. After three consecutive years of decreases, which have sometimes been considerable, 2018 quotations indicate a very slight upward trend compared to the opening quotations of 2017 (+2%) and compared to the most recent quotations of July. The gains are measured, but in a pattern that is encouraging for the industry, they are also stronger than those of the latest prices published before the usual summer hiatus (+3%). So the 2018/2019 marketing year could be considered as a timid indication of consolidation in market prices, a fact that is essential if not vital for the industry after several consecutive years of depreciation, which brought a number of players of the worldwide industry to a critical point in their operations. Clear indications of this pattern can be observed in Europe, in the United States, in China and elsewhere, as recent takeovers, mergers, restructuring plans, business re-orientations and closures have all been frequent occurrences in recent years. The landscape of the worldwide industry has shifted profoundly because of the crisis it has been facing since 2014/2015. Differences with regards to opening prices in 2017 concern all types of products, but they are minimal. Triple-concentrated pastes produced in 2018 (minimum refractometric index of 36%, conditioned in drums) have been valued at EUR 950 /metric tonne (mT), which is EUR 13 (+1.3%) more than in October 2017. Double-concentrated Cold-Break paste (28% minimum, in drums) has recovered EUR 18 (+2.4%) at EUR 735 /mT, while the new price for Hot-Break double-concentrated paste has increased 2.2% (EUR +16) compared to its quotation price in October 2017, at EUR 750 /mT. 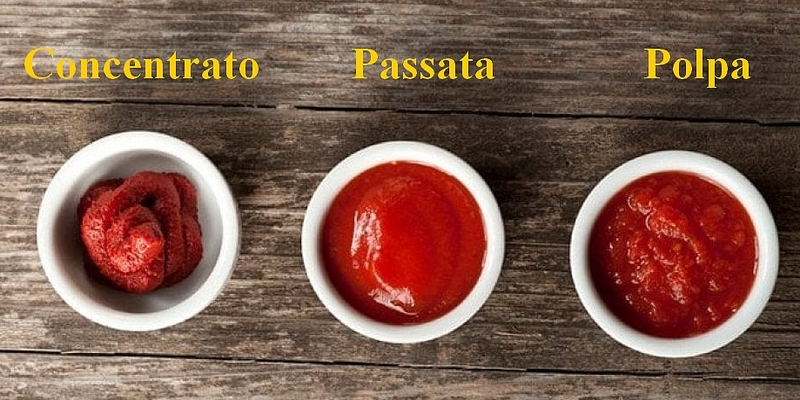 The smallest gain has been recorded for passata (8% minimum, in drums), which has increased by 1.2% at EUR 430 /mT. 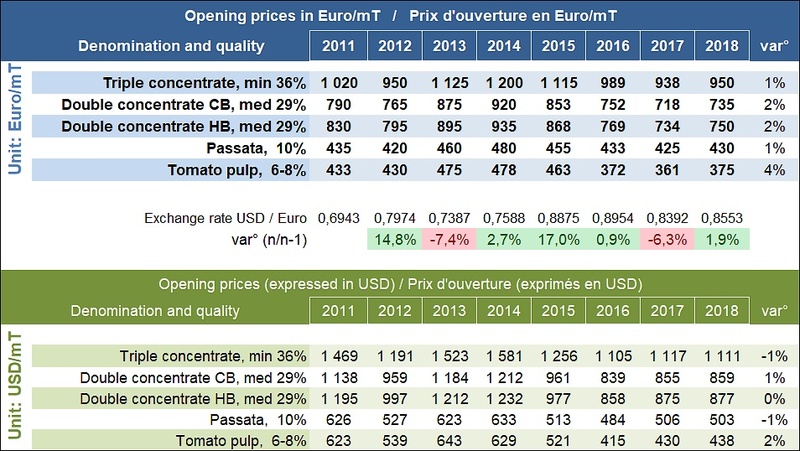 Finally, the opening price for pulped tomato has recorded the sharpest increase, with a gain of almost 4% (EUR 14) at EUR 375 /mT. When quoted in US dollars, these new quotations are practically unchanged compared to those of October 2017. The slight consolidation of the US currency against the euro (+1.9% compared to the exchange rate of October 2017) almost wipes out any increase recorded in Euros for the different types of products: a variation of less than 1% either way for triple-concentrated paste, for CB and HB double-concentrated paste and passata, and less than 2% for pulped tomato. This upward trend in the latest quotations in Italy can also be observed in other major worldwide production zones of tomato product supplies. IEG Vu recently commented that the prices of 28/30 tomato paste have noticeably increased this year in the United States, climbing from USD 680 /mT in September 2017 to USD 780 /mT in September 2018, a 15% increase, but that nonetheless does not bring US products anywhere near their best levels (USD 930 /mT), which they reached in 2014. According to the same source, the prices of Spanish pastes have recorded a measured increase, similar to what has been observed with Italian products. In Spain, the price of 28/30 paste has increased from EUR 600 /mT in 2017 to EUR 640 /mT this year, which is a gain of approximately 7%. The increase observed for 36/38 paste is even more limited, at approximately 2% (from EUR 760 /mT last year to EUR 775 /mT this year). Despite the absence of official statistics from China, several professional sources have also confirmed a notable consolidation in the quotations of Chinese products in recent months. The current situation of the Chinese industry, which has been facing drastic decreases in its production levels, gives reason to believe that "prices will continue to increase in the future, after having climbed approximately 10% compared to the previous season." Prices have gained a few points, yet not only remain well below their best levels, but also below the levels that many professionals of this sector consider as reasonable thresholds for profitability. It is therefore encouraging to observe the slight recovery recorded by the main worldwide prices of tomato products as the current 2018 processing season is ending. Processed volumes have not been this low since 2012/2013, so it will be necessary to call on existing stocks in order to satisfy demand, and this should have a positive impact on worldwide prices of tomato products in coming months. In a recent report, TomatoLand underlined the close similarity between the volumes processed during the period running 2009-2012 and those processed during the period running 2015-2018. Banking on the cyclicity of global operations, it is estimated that "we can clearly expect a sharp increase in prices, like the one that processors enjoyed six years ago." Convergence of Italian prices for Cold-Break and Hot-Break pastes over the past 25 marketing years. Over the past five years, the average difference has not exceeded EUR 16 /mT. Sources: Camera di Commercio Parma, IEG Vu, TomatoLand, TomatoNews, misc.